Undertale creator Toby Fox took to social media yesterday to show off some early notes about the game’s creation. 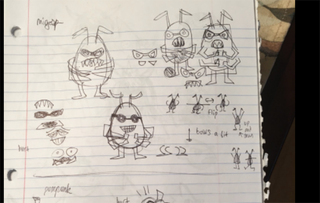 The notes feature early concepts for gameplay systems as well as early sketches of some beloved characters. The notes were scrawled in a notebook that Fox used in college. Some of the initial pages show the concepts for the game’s morality and combat systems. Somewhat more striking are the various drawings of fan favorite characters like Papyrus, Sans, and Undyne. Papyrus would have worn a fedora during the date sequence and Undyne looked a lot more like a fish. In addition to the character sketches, there’s a small bit of redacted information about another character related to Sans and Papyrus. Perhaps a veiled reference reference to the mysterious W. D. Gaster? It’s interesting to see early versions of familiar characters. Undertale has a devoted fan following and much of that has to do with its memorable cast. As for Toby Fox? His takeaway is simple.